Volcanic advances exploration of artisanal gold workings at the Mandiana Project, Guinea; identifies further mineralized target zones | Volcanic Gold Mines Inc.
July 26, 2017 – Vancouver, British Columbia – Volcanic Gold Mines Inc. (“Volcanic”) (TSXV: VG) is pleased to report details of its mapping and prospecting program at its Mandiana Project in Guinea. 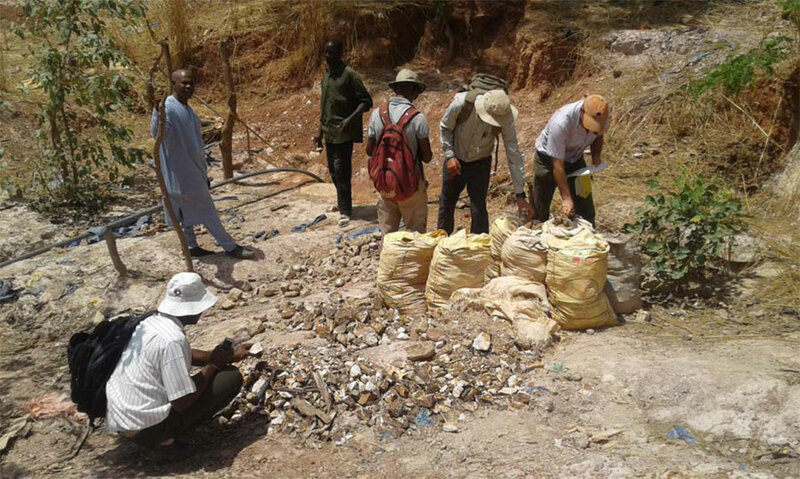 Recent field activities have focused on a linear zone of artisanal workings 6.3km in length and up to 550m in width at Tadibakourou, at which coarse gold has been recovered from numerous shallow pits and shafts. 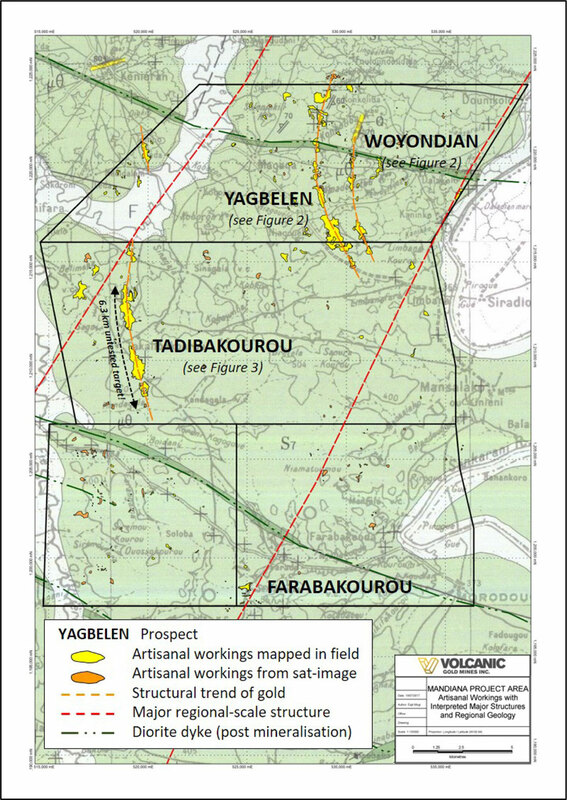 Figure 1 below illustrates the extent and orientation of artisanal activity at Tadibakourou relative to workings and the current Resource at the Yagbelen and Woyandian zones (see Volcanic news release November 8, 2016). Mapping during the 2017 field program has led to the identification of numerous artisanal pits and shafts from which gold is routinely recovered from vein quartz material by means of gravitational concentration. Anecdotally, gold recoveries of up to 2kg per shaft – some of which extend to depths in excess of 70m - are reported. The workings fall in close north-south alignment to one another, and frequently associate with large, readily discernible haloes of white kaolinitic alteration (Figures 4, 5, 7 and 8) which further facilitate their mapping. Mineralization at Tadibakourou, Yagbelen and Woyandian is now interpreted to relate to a series of sub-structures within a broader mineralizing structural trend, shown in red on Figure 1. Figures 2 and 3 show workings at each of these deposits in greater detail, and from these, important inference as to the resource potential of Tadibakourou can be made. It is anticipated that further structural and targeting detail will arise from Volcanic’s forthcoming high-resolution airborne magnetic survey of the property. The Tadibakourou deposit will be tested by means of air-core drilling in the final quarter of 2017, as the next step moving the deposit to resource definition. It is envisaged that a similar exploration approach as deployed by Volcanic as at Yagbelen (see news release July 12, 2017) be adopted in drilling at Tadibakourou. Of great significance is that artisanal working at Mandiana is seen to follow the same north-south mineralized trend common in known deposits in the region, including the Siguiri Mine, 80km to the north. Past drilling beneath approximately 1km of strike length of such workings at Mandiana led to definition of a Resource, as well as numerous outlying bedrock and saprolitic gold occurrences. More recently, air-core drilling by Volcanic has identified a mineralized strike projection of approximately 500m to both the north and south of the Resource (news release July 12, 2017). Results of air-core drilling from a further 1,250m of strike potential of this trend are awaited. Artisanal workings are typically shallow, sparsely populated, and restricted to examination of laterite and saprolite above the water table. 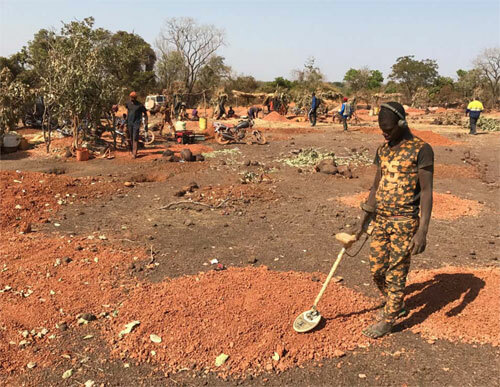 Due to the shallow occurrence of coarse gold in the laterite, artisanal diggers make highly effective and meticulous use of metal detectors in their search for gold (Figure 9). Having identified gold and quartz rubble, diggers then excavate in search of further vein material and gold. Many kilometers of artisanal workings remain to be drill tested. In January 2017, Volcanic acquired an indirect 75% interest in a Guinean entity, Guiord SA, which owns 100% of the Mandiana Project in Guinea. 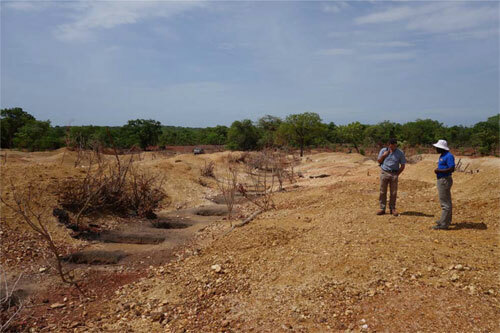 The remaining 25% interest in the Mandiana Project is held by SOGUIPAMI, a Guinean government-owned business entity formed to conduct mineral exploration projects. In April 2017, Volcanic entered into a binding letter agreement to acquire 80% of WAMA, a private Guinean company, the landholdings of which together adjoin the entire length of the southern boundary of, and lie within the same mineralized trends as Volcanic’s Mandiana Project. The Mandiana and WAMA Projects are underlain by geology comparable to that of many other Birimian-age volcano-sedimentary sequences in West Africa, in which gold mineralization typically exhibits a strong relationship with major structural and hydrothermal zones. At both the Mandiana and WAMA Projects the gold mineralization associates with a network of quartz veins which appear to relate to such zones, and is located at major lithological and structural breaks. In the near vicinity and of very similar geological character is AngloGold Ashanti’s Siguiri Gold Mine (Measured and Indicated Resources of 3.37 Moz Au and Inferred Resources of 2.14 Moz Au). Other significant gold deposits and mines in the neighbouring area include Hummingbird Resources’ Yanfolila project, Avnel’s Kalana property, and Avocent’s Tri-K project. As well as serving to infill the Resource, the RC and diamond drilling has also allowed Volcanic to gather extremely valuable information on the geological controls on mineralization. Based on work completed to date, gold mineralization is seen to occur preferentially in a series of bedded sandstone units; these units are repeated in all holes, and their characteristics will serve as a key targeting tool in Volcanic’s forthcoming resource drilling program. Air-core drilling has been successfully deployed in the identification of extensions to the north, east and south of the Yagbelen Resource, in which regard it has defined a further 1,000m of strike potential. 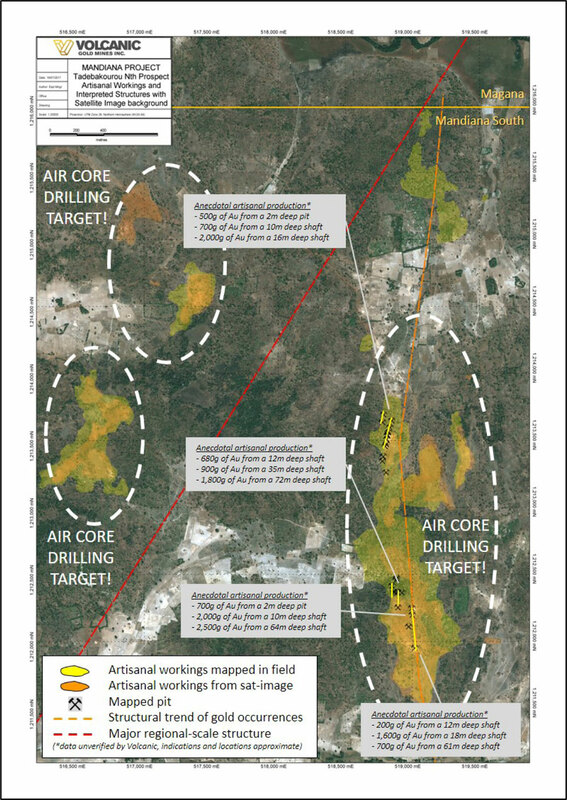 Initial air-core results clearly illustrate the strike continuation of a strongly anomalous gold mineralization extending approximately 500m to both the north and south of the Resource, as well as laterally, 500m to its east. The weathering profile at the property extends in places to depths in excess of 200m from surface, producing friable, oxides material which beneath the lateritic profile is very easy to dig. 1The reader is advised that the above results are historic in nature and are yet to be verified by Volcanic. 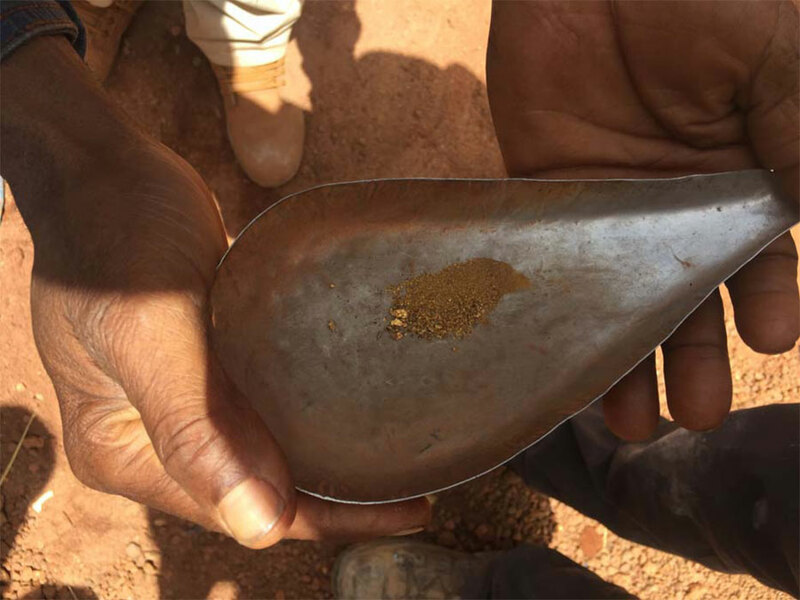 Volcanic brings together a deeply experienced and successful mining, exploration and capital markets team focused on building a multi-million ounce gold resource in the underexplored West African country of Guinea and its neighbouring countries. 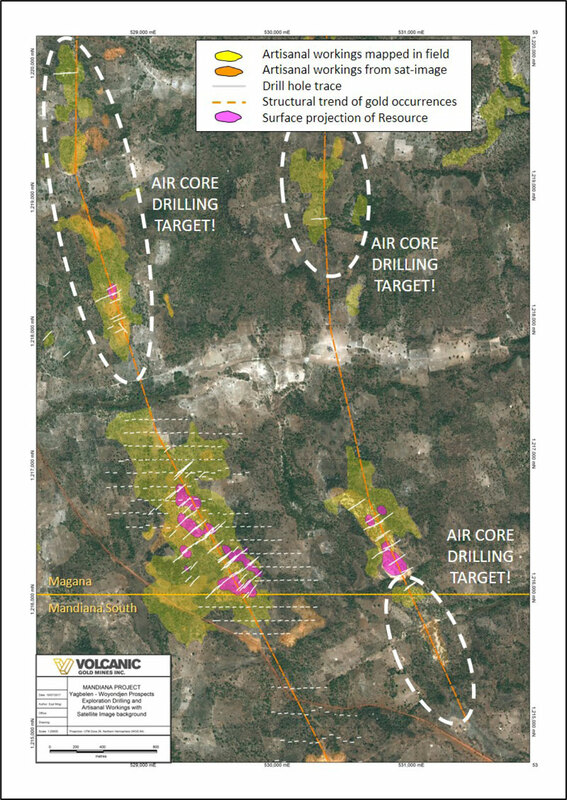 Through the strategic acquisition of mineral properties with demonstrated potential for hosting gold resources, and by undertaking effective exploration and drill programs, Volcanic is seeking to become a leading junior gold resource company. Mr. Simon Meadows-Smith is a Qualified Person as defined by “National Instrument 43-101 - Standards of Disclosure for Mineral Projects” and has approved the disclosure of the scientific and technical information contained in this news release. Mr. Meadows-Smith holds a BSc degree in geology from Nottingham University, England, and has been involved in mineral exploration since 1988, including 20 years of experience working in West Africa. He is a Fellow in good standing of the Institute of Materials, Minerals & Mining in London. For further information, contact Alex Langer, the Company’s VP Capital Markets, at 604-765-1604, or visit our website at www.volgold.com. Certain statements contained in this news release constitute forward-looking statements within the meaning of Canadian securities legislation. All statements included herein, other than statements of historical fact, are forward-looking statements and include, without limitation, statements about the Company’s exploration plans for the Mandiana Project. Often, but not always, these forward looking statements can be identified by the use of words such as “estimate”, “estimates”, “estimated”, “potential”, “open”, “future”, “assumed”, “projected”, “used”, “detailed”, “has been”, “gain”, “upgraded”, “offset”, “limited”, “contained”, “reflecting”, “containing”, “remaining”, “to be”, “periodically”, or statements that events, “could” or “should” occur or be achieved and similar expressions, including negative variations. Forward-looking statements involve known and unknown risks, uncertainties and other factors which may cause the actual results, performance or achievements of the Company to be materially different from any results, performance or achievements expressed or implied by forward-looking statements. Such uncertainties and factors include, among others, whether the Company’s exploration work on the Mandiana Project will proceed as intended; changes in general economic conditions and financial markets; the Company or any joint venture partner not having the financial ability to meet its exploration and development goals; risks associated with the results of exploration and development activities, estimation of mineral resources and the geology, grade and continuity of mineral deposits; unanticipated costs and expenses; and such other risks detailed from time to time in the Company’s quarterly and annual filings with securities regulators and available under the Company’s profile on SEDAR at www.sedar.com. Although the Company has attempted to identify important factors that could cause actual actions, events or results to differ materially from those described in forward-looking statements, there may be other factors that cause actions, events or results to differ from those anticipated, estimated or intended. Forward-looking statements contained herein are based on the assumptions, beliefs, expectations and opinions of management, including but not limited to: that the Company’s exploration work on the Mandiana Project will proceed as intended; that the Company’s stated goals and planned exploration and development activities will be achieved; that there will be no material adverse change affecting the Company or its properties; and such other assumptions as set out herein. Forward-looking statements are made as of the date hereof and the Company disclaims any obligation to update any forward-looking statements, whether as a result of new information, future events or results or otherwise, except as required by law. There can be no assurance that forward-looking statements will prove to be accurate, as actual results and future events could differ materially from those anticipated in such statements. Accordingly, investors should not place undue reliance on forward-looking statements. Figure 1: Mapping of artisanal workings and prospective mineralization at Mandiana and WAMA. Figure 2: Detailed mapping of the Yagbelen and Woyandian prospects showing distribution of artisanal workings and drill targets relative to the Resource (in magenta). Figure 3: Detailed mapping of the Tadebakouro prospect showing distribution of artisanal workings, vein occurrences in outcrop (in Yellow) and drill targets. 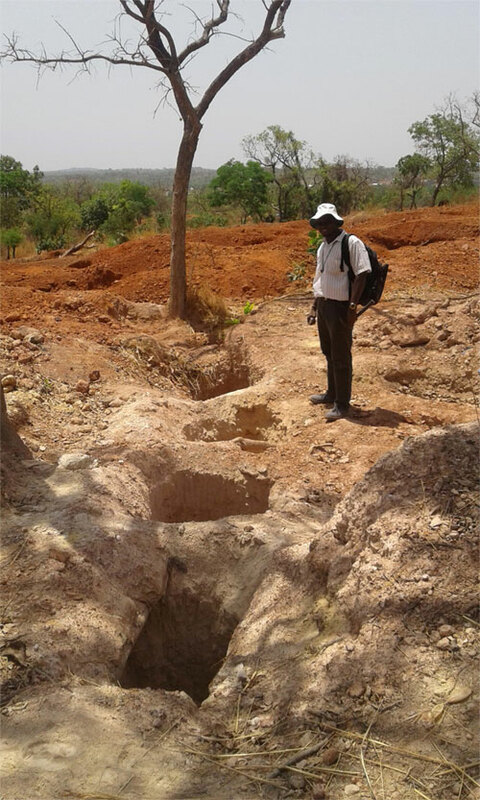 Figure 4: Extensive artisanal workings in laterite at Tadibakourou. White kaolinitic clays seen in spoil piles associate with quartz veining, and readily delineate linear mineralized trends. Figure 5: Artisanal pitting south of existing Resource at Yagbelen. Pits are aligned perpendicular to the strike of mineralized quartz veining, seen in abundance in spoil piles. Figure 7: Mineralized quartz veins recovered from hand-excavated shafts ~20m in depth (example behind worker in green shirt where pipe enters ground) by artisanal workers. Figure 8: Artisanal working of kaolinitic saprolite follows linear north-south trend. Figure 9: Identification of nugget gold using metal detector. Material collected. © Copyright 2019 Volcanic Gold Mines Inc.